Central you can hardly live in Wroclaw! The 42 square meter apartment is located in a historical house right on Main Market Square. The apartment consists of a back yard facing rooms, were combined in the living and sleeping area, a separate kitchen, which emanates from the lively marketplace and a bathroom with shower / WC. Sleepwear is in the room next to the 1.60 x 2.00 m wide double bed and a sofa bed (1,60 x 2,00 m), which can be converted from the seating area. The kitchen is u. A. With a 4-burner stove with oven and fridge completely equipped. Washing machine (no dryer), hair dryer, iron and of course freshly made beds and towels, Wi-Fi are available. Thanks to the alignment and the soundproof windows the sounds of the vibrant Old stay out. You just need to go out of the apartment and you are in the heart of the city, with its diverse range of restaurants, bars and cafes. Most of the sights, the Opera, the Philharmonic (National Music Forum) are removed in a few minutes. The apartment is ideal for 1-2 couples, families with 2 children or solo travelers. Since the apartment is located in the pedestrian area, unfortunately there is no possibility to park right outside the apartment, to load and unload your luggage. The place where you can park closest is about 150 meters away. Several other parking facilities are nearby. The parking on the streets is the best (max 30 PLN / day), but in the old town generally difficult. 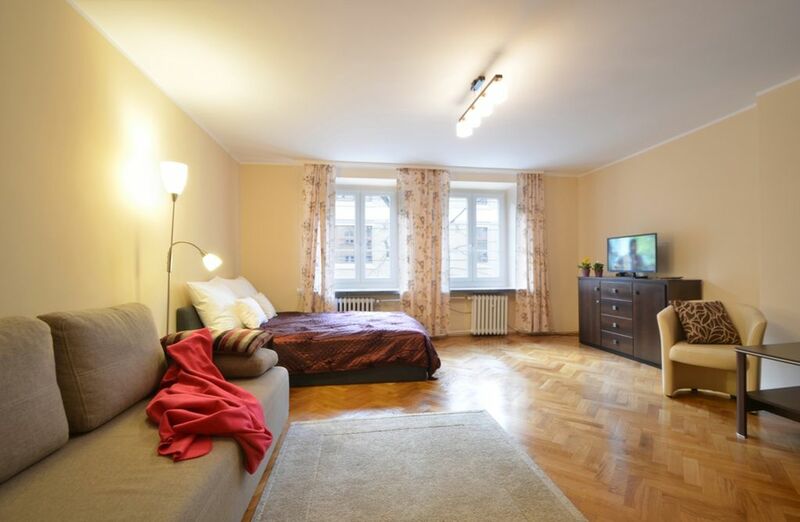 Approximately 300 meters from the apartment is a parking garage (price per 24 hours 69 PLN). Bathroom with comfortable shower. Washing Machine. Dear Dana, thank you very much for your stay and your excellent review. I'm glad you've enjoyed our quiet apartment in the middle of the market square. You 're welcome back anytime again. Alles super und wie beschrieben. Auch im Vorfeld und in der Kommunikation mit der Vermieterin keine Probleme. Die Vermieterin spricht gut deutsch. Optimal gelegene, gut ausgestattete und sehr saubere Ferienwohnung. Einkaufsmöglichkeiten (Bäcker, Supermarkt) in unmittelbarer Nähe. Freundliche und zuverlässige Vermieterin. Der Marktplatz liegt vor der Haustür und mit ihm alles, was besonders sehenswert ist. Das Schlafzimmer geht zur hinteren Seite und hat schalldichte Fenster, so ist die Nachtruhe garantiert. Alles war schön und sauber, empfehlenswert! Die übergabe hat wunderbar geklappt.